For +Ingress players like myself, that was great. I could run outside at coffee break time, hack some portals and feel nothing. Lately it's gotten cold. This week it's going to be average of -21C or more, and windchill in some areas down to -40C. Yoiks. 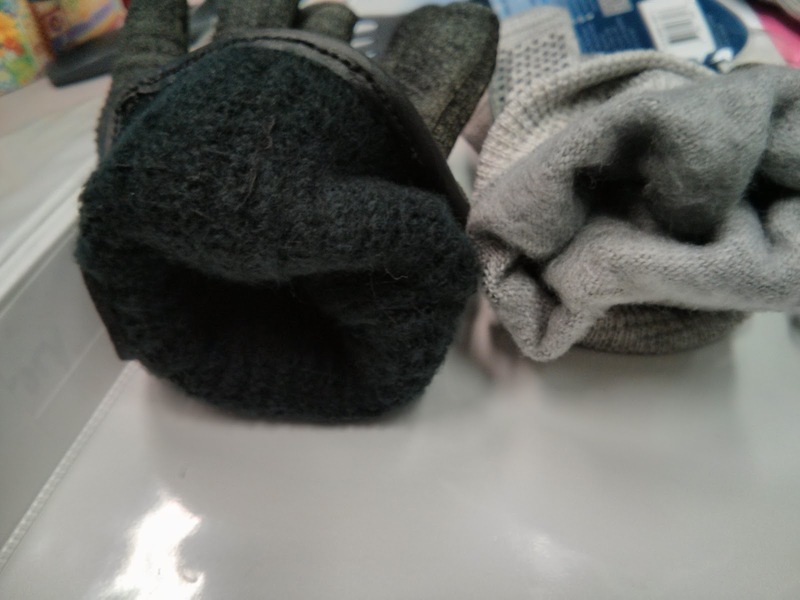 Running outside with gloves on and removing them to hack, then putting them back on just isn't going to cut it. So I looked for some options. 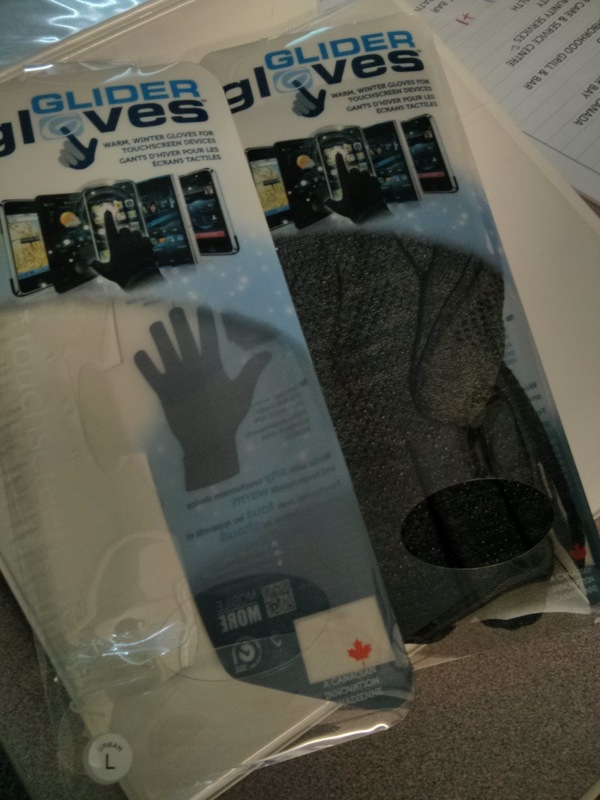 +Glider Gloves was highly recommended and they're a Canadian company in Toronto as well! So... how do they do? Well, first let's talk options. I gotta say I was impressed to see their website had a really good sizing guide! Then, if you care, there's some colour options. I got a pair of 'urban' and a pair of 'winter'. As you can see to the right, the urban are a little thin protection and the winter has a little more. Not much, but a noticeable amount of difference. When I first got them out of the box a co-worker was keenly interested in them so she tried on the urban, and I tried on the winter. I found them to be a little tight, and as I usually find the fingers are a little long. Still worked fine, just had to link my fingers together to push the material in. It was a snug fit. The pads on the glove are a nice addition to keep grip. But I wonder how long they'll last as they're quite exaggerated, so they may either rub off or get ripped off over time. Not a big concern. For me the bigger issue is would they work. They do. The urban pair really needed to push to work (at first I thought it was just her iPhone that wasn't working with the screen guard, but trying it on my phone without it was the same). The winter pair worked perfectly. Neatest thing was that the whole glove is conductive. Which means that I could use my knuckles as well as my finger tips (take that, those cheap models with just tips of fingers). And here's why - even the winter models aren't that warm. Or, it's SUPER COLD. Which I think it's a bit of both. I didn't even bother with the urban models as it's in the sub -30 weather. And really, when it's that cold, you shouldn't go out playing Ingress anyways with your phone. When I did my test I kept my hands out of my pockets the entire time and you can really feel the wind come in the seams by the fingers. Best practices should be to keep your hands in your pockets and take out only when you need to... that way they should be just fine. If your temperatures are warmer than mine any of the models should work for you. Check out the site: www.glidergloves.com and there's even some on sale right now! Even with the chill, I'd still recommend them for usage. Sure there's some cheaper models out there that I've seen, but they probably won't be as warm, or they'll only work with just the tips of your fingers (my coworker bought a pair of lululemon ones and they're colder and use only the tips of the thumb and index finger). You could also try those DIY ones, but I'm not sure a) I trust my threading skills b) I'd be worried if the threads might scratch the screen.